Slice zucchini into frites or fries. In one bowl place the flour. In another bowl place the beaten eggs. In a 3rd bowl mix the Panko, breadcrumbs, cheeses, garlic powder and salt. In a medium skillet heat oil on LOW. If using a larger skillet add more oil. Coat zucchini one by one in the flour. Then coat in the egg. Lastly dip in the breadcrumb mix. Do not overcoat the breadcrumbs or else it will begin to fall off the zucchini. Fry the zucchini turning it about every 1 minute until it is a dark golden brown all over. Serve with warmed marinara sauce dip. There’s a restaurant near my office that serves something similar, and they’re to die-for. I’ve always wanted to try that at home but didn’t know how-I’m saving this recipe so I can. They look amazing-great post! Thank you! I’ve tried them too at an Italian restaurant except they slice them lengthwise and serve with Marinara sauce on the side. Yum! Your dessert recipes look fantastic. I especially like your Winesday tradition. Sweet! Thank you for your comment! 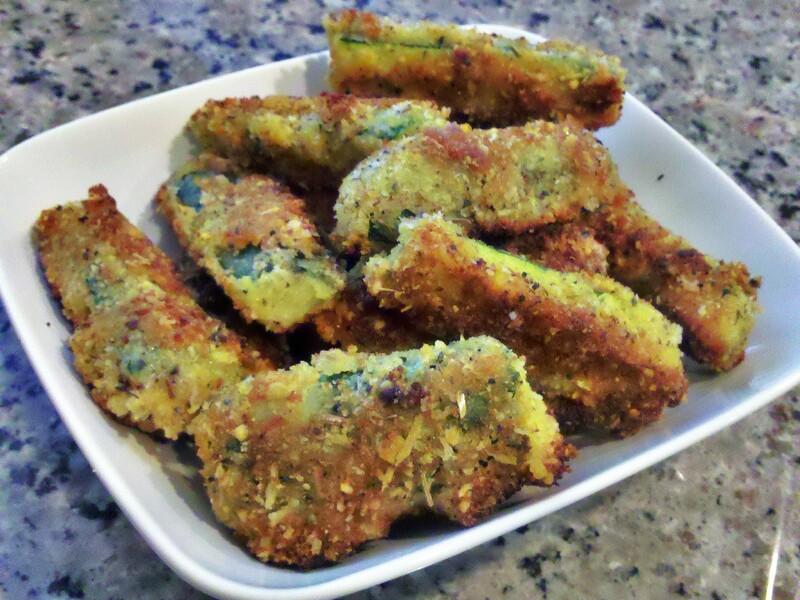 Zucchini fries make great home-movie munchies. Top them with garlic-salt. Yum. Oh, my! These look sensational! Hi, thank you for the compliment Cara! They’re great topped with garlic salt for home movie-night munchies. Hi Southbyse, thank you for your comment! Tip: batter all the zucchini first then fry. I was frying them one by one as I was battering them and it made for a very tedious and messy task. Oh well, you cook and you learn! Shop around for grapeseed oil (imported from Italy) as prices vary greatly. I love your Salt logo. I use sea salt now – the kind that hasn’t had all the minerals stripped from it through processing. I have yet to explore the varieties of salt. I’m definitely intrigued. Thank you Kristin! I thought about adding garlic-salt seasoning afterward. That will be for next time. That’s not a lot of oil to fry in. Most recipes I see drown them in oil. This will be a great one to try. Thanks! Hi hotelgeek – thank you for your comment! They make for great movie munchies. Top them with garlic-onion powder or dip in marinara sauce. Yum. Oh, I just looked up courgettes on my Mac dictionary [noun Brit. a zucchini] and so it is zucchini (they look like cucumber). looks great – is it a 1/2 cup each on the cheese or combined? It’s 1/2 cup each or combined. Thanks for catching that and visiting my cooking blog! I see these all over pinterest these days. Absolutely lovely! Why did you choose grape seed oil? Thank you for your comment! I use grapeseed oil for all my cooking because it has a very high flash point which makes it a natural choice for sauteing, baking, frying and deep frying. It’s also low in saturated fat (lower than olive oil) and high in the good fat Polyunsaturated. So it can be used for salad dressings, pasta toss, marinades and basting. Grapeseed oil does not have an aroma so for salads and dressings I prefer olive oil for the aroma and flavor. Prior to grapeseed oil, canola oil used to be my cooking oil of choice until I learned it is genetically modified.